Wow! Well, I have definitely fallen behind! So what have we been up to that has kept us away from the wonderful world of blogging? It is the beginning of the holiday season and my(Courtney) work has been swamped! Today we had 50 appointments on the books...in just 7 short hours!!!! It's crazy busy...and I love it! And then outside of work, I've been prepping for Thanksgiving. We are hosting dinner at our apartment this year. I'm making the turkey, potatoes, and desserts. And my cousin is making all the veggies and rolls! I still have to clean the house sometime this week....yikes! Plus, we're getting ready to move soon. Found a new apartment with some great amenities...fireplace, our own washer and dryer, and tons of fitness classes. We're really excited about it! Moving day is Mid December. Matt has been busying flying here and there. He actually was able to come home for a few extra days after a big trip! It's so nice when he's home. We're spending a lot of our time focused on finishing up our adoption paperwork. Most is done....just waiting on a few things to come back! I know that I'm very excited about the whole process. I think we are going to be good parents. And honestly, I'm a little nervous...I get to play with children all day almost everyday at work. But when we actually have a child of our own...it isn't just making them smile and laugh...it's teaching them right from wrong. Teaching them how to be truly happy... Teaching them everything they'll need to know to fight against the powers of Satan. That's a big responsibility...and it's kind of scary! I believe that Heavenly Father trusts us with his precious spirit children. And I know with His help, we'll be able to get them back to Him. Now, my hero is my younger sister! She is amazing...her strength is inspiring. She has a huge heart with a giant desire to love the people around her. And she has courage to stand up for what she knows is right, and forgive those who have hurt her. I endeavor to be like her. Matt: During my younger years my hero was Luke Skywalker form the movie Star Wars. As it tells a story of a young man who it comes from humble situations, and rises up to help lead the rebel rebellion. I thought that I could become like that. Rush Limbaugh, as he helps keep me informed on all the liberal media hype, and lets me know that I am not alone in my conservative ideas. I'm not nervous. Well, maybe I was a bit...concerned but that's not the same thing. Courtney: I call my mom and dad. Or any member of my family that will actually answer the phone! I talk about what's going on with my parents. With my siblings, I talk about silly and random things, teasing them, and goofing off with them. And while I talk, I pace...Up and down the hall, around the kitchen, I have to be moving. And when in a situation where pacing is not the best idea, I fidget. I have to have something in my hand that I can play with. Like a rubber band, or a pen, or clothing. Movement, in any form, is my coping mechanism. I have to be doing something. Matt: I get scared and embarrassed that I have already made too many mistakes and that I have failed , like when interviewing for a new job or taking my 6 Mo check ride..my job is on the line. I just want to get away from the situation, or the people that I am around. And do something fun to take my mind off of that situation, like working out or watching a movie. The leaves are starting to turn yellow and orange. And as the air is cooling down I've been thinking about the holidays. Describe your favorite holiday tradition? Courtney: In my family, a lot of traditions center around food, like making Pumpkin Roll, Buttermilk pie, and Reindeer Droppings. It's not really Christmas or Thanksgiving with out it. But I think my favorite tradition would have to be our Christmas sibling gift exchange. As a kid we would draw names and would have 20 dollars to spend on that person. It's like a Secret Santa. Only the tradition really is how you buy the present! See, we would all pile into the car and go shopping together. We'd go into Target, get 2 carts, and start shopping. Mom would have one basket and Dad would have the other...and you'd shop for your person. The trick was that they were there too! And you had to do a cloak and dagger thing to get it into a basket without the others knowing who you had, and what you got them! Imagine having 7 people running around trying to keep everything secret. After everything was paid for, and stored safely and secretly in the back, we would go out for a nice dinner. It's kind of hard to do it with just two people. But this is a tradition that we will do with our children. I have so many wonderful memories, and I want my children to have the same chances of creating their own magical memories! Matt: One of my fondest memories during my early years was carving pumpkins. I loved to clean out the insides, puling out the seeds and "guts" of the pumpkin. And help my mom wash the seeds, place them on a cookie sheet, and bake them. Yumm, they are so good. We had to wait until dad was around so that we could use the sharp knives to cut out faces in the side of the pumpkin. It was always a challenge with my siblings to see who could come up with the scariest or goofiest face, and place it on the pumpkin. Courtney: Camping! I love cooking over an open fire, snuggling into a cozy sleeping bag, and enjoying a nice warm cup of hot chocolate in the cool mornings. It's nice not to have to worry about what time it is...if it's light it's day time, if it's dark it's time to wind down for the night. It's so simple and relaxing. It's great to get a bunch of family or friends to go with you. Camping allows you a lot of time to really spend quality time together. And honestly, I think everything tastes better when it's cooked over a fire! Oh! and how can anyone deny the awesomeness of S'mores?!??!?? Matt: Surfing the internet. Oh wait, thats my blackberry. Hiking! I just love being outside and trying be unplug myself from the demands of the job and just connecting with the great outdoors. "What is your least favorite chore?" Matt: I hate cleaning the bathroom. Just because it's a bathroom. Please let us introduce ourselves. We are Matt and Courtney. This lovely blog is for prospective birth parents to get to know us a little better. We want this blog to be a place where we can share more openly who we are as a family. We want to share the things we do that make us Matt and Courtney. Keep checking back! Well, we might as well start at the beginning! Here's our story of why we're hoping to adopt someone special! We decided a few years ago that we wanted to expand our family. We, of course, started trying...We heard it's supposed to be pretty easy. lol But about 18 months later we found out that we aren't physically able to conceive children. 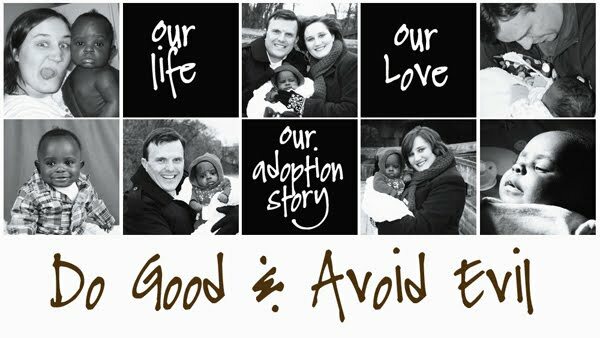 After numerous doctor visits and many hours in prayer we decided that our family would grow through adoption. We felt that it didn't matter if we aren't physically able to bear children...we are physically, spiritually, and emotionally able to be PARENTS! We strongly believe that family is what you make it! That you don't have to be born into a family to belong there. And by the sealing powers of the priesthood, the children that we parent, will enjoy the blessings of an eternal family.